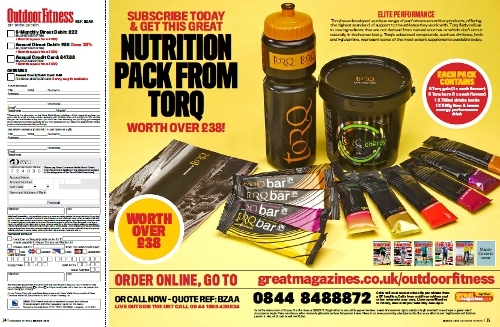 TORQ features in Outdoor Fitness magazine this month where the subscriber is offered £38 worth of TORQ products free of charge if they subscribe with the magazine. The offer includes a 750ml TORQ wide-mouthed visi-strip drinks bottle, 500g of TORQ energy drink powder, 6 TORQ energy gels, 5 TORQ energy bars and a 52-page Performance Resource booklet. So, if you’re into the outdoor life and fancy a monthly posting from the guys and gals at Outdoor Fitness, it’s an ideal opportunity to get your hands on a free supply of TORQ. Outdoor Fitness is on the shelves now, so pop down to your local stockist to pick one up.